I hope to get a few fun things finished to take to the sale event next Saturday, but after going through my inventory last night I realized that I have nothing for baths for adults (but lots of bubble wash for the kiddos! Lol). 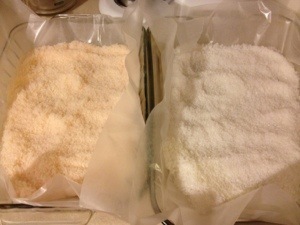 I decided to make a few batches of bath salts and package them in the cello cone bags that I used for the chocolate covered cherry swirl cones (see my website for a pic if you’d like). I figure that it’d be a pretty sure bet since the cone size is rarely more than $4 and I can make several pretty quickly (not counting drying time). I made a batch of On a (Pumpkin) Roll and a batch of Spa. A little seasonal and a little ahhh. *grin* I’m crossing my fingers. Posted in The Holidays and tagged bath, Homemade. Bookmark the permalink.